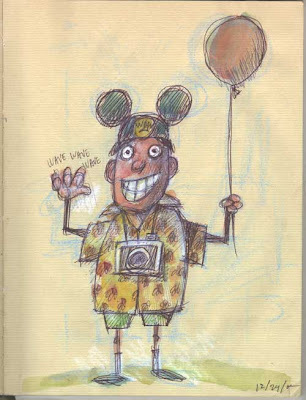 Here’s a sketch I drew while vacationing at Disney World in Florida. I remembered I had a balloon in it, so here it is. Good memories. It was a great time on the “happiest place on earth”. I really, really, really like this illustration. Your line work is outrageous! I really love it! Your style is wonderful and fresh. It reminds me of something retro and vintage. Something very comforting about it! I wil be back to more of your deliciousness! It looks like he had a great time! I really like the pencil work! I hope our memories will be as good as what yours look like in your illustration. We hope to take our kids next year. Nice work. Hehehe, gotta love a guy who doesn’t take himself too seriously. Excellent sketch. The little wiggly fingers are a nice touch. What a happy illo! Disney World!! Goood Time!! heya. i met you at the mediabistro holiday gathering. love your work. always nice to meet another cartoonist. keep it up. cheers, anna.